The crane industry has seen many fatalities due to insufficient fall protection for technicians who need to access facility cranes. 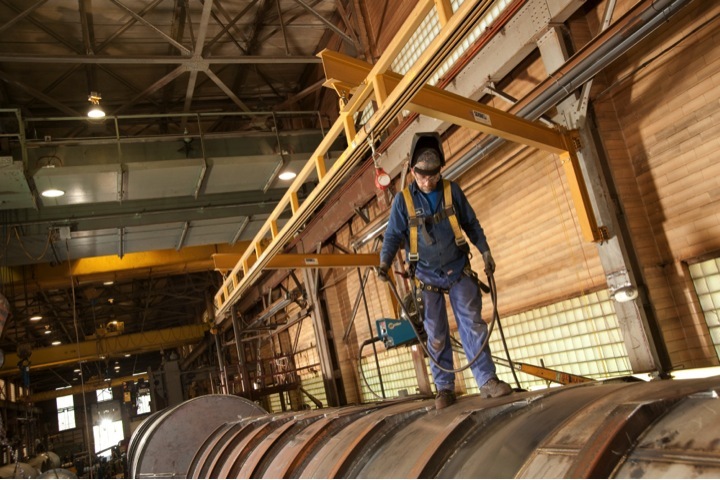 Crane maintenance and inspections require workers to access overhead cranes system in areas that can be dirty, narrow, and cramped, with little space to move. There is also little information available about how to effectively operate industrial cranes around workers using fall protection systems that are tied off to an overhead attachment. In these circumstances, overhead cranes and overhead fall protection must work in the same space without coming into contact with one another. Although OSHA rules regarding fall protection in industrial crane environments are not well defined, this is a real concern. Workers at height who have to guide a load, for instance, still need to use fall protection. Using fall protection in an industrial crane environment can create many potential hazards—including crane contact, structural impact, entanglement, and dragging. Luckily, Mr. Arnie Galpin, Engineering Manager for Spanco and Rigid Lifelines, published an article outlining these concerns and viable solutions in the ASSE’s “Safety 2012” conference proceedings, which are available through ASSE.org. This is a rundown of his professional insights, including current best practices in general industry and other industries, examples of how workers can be kept safe while using fall protection around cranes, and examples of how fall protection anchorages can be provided in industrial crane environments. The following recommendations are provided ONLY as a reference for how to potentially furnish a hazard-free place of employment. See the full white paper for the comprehensive review of this topic. When developing fall protection plans, employers should also employ other controls to protect workers from external hazards. For instance, if a worker is performing maintenance on an overhead crane system while another system is traveling along a shared runway, administrative controls must be employed to prevent impact and workplace intrusion issues. Create a checklist to ensure proper steps are taken before any work begins. Have a meeting to notify crane operators, workers, and supervisory personnel of the day’s work schedule. Crane operators who are using the same runway as a crane that is receiving maintenance must be aware of their limited travel lengths. It’s important for crane operators to know that impacts with cranes that are “down” or being “serviced” can result in serious injury or death. Post your work schedule in a place that is visible for all affected workers to ensure that no one is surprised when they see a roped-off area on the floor. Rope off the floor area below the crane with highly visible security tape or personnel barriers. This will prevent workers from entering an unsafe area where they could be hit by falling tools or parts, and also act as a visual reminder to crane operators that there is an inoperable crane with workers on the crane structure above the roped-off barrier. Hang a 4X6 fluorescent flag from the runway to notify crane operators of the crane in service. Perform a lockout and tag-out on the runway and bridge crane being inspected or repaired. If maintenance will occur on the bridge only, and the remainder of the runway needs to be electrified, lockout and tag-out the bridge and section of runway under repair. Use temporary runway rail stop clamps. These will help prevent the intrusion of a powered crane into the working area of a crane undergoing repair or inspection. Stops will not guarantee that a powered crane will stop, so place them at least 15 feet from any personnel lift or crane undergoing maintenance. Rather than rail stops, consider positioning temporarily disabled “buffer” cranes between live cranes to separate them from cranes being serviced. Use the “buddy system”. While the primary worker focuses on the repair or inspection, the second worker can remain aware of the surroundings and potential dangers. The second worker can also assist in the event of an injury or emergency. Employ fall protection as defined below. Crane inspectors must have full access to every section of the bridge and runway to make sure structural supports are functioning properly and free of damage. If personnel lift access is not available, and the crane’s work area prevents the use of a passive system, the next choice is an active form of fall protection, like fall restraint or fall arrest. Fall arrest can be used along runways and bridges. Single point attachments work well on hoists if a boom lift can safely provide access to the attachment points. The most common usage of fall protection along a runway consists of: wire rope and rigid track. For fall protection along a bridge, common options consist of: guardrail/walkways, wire rope, and rigid track. For fall protection at the hoist, common options consist of: boom lift, fall restraint, and single point attachment. There are multiple configurations available for fall protection beneath industrial overhead cranes. Systems like foldaway monorails, fixed monorails, rotating swing arms, and wall-traveling jib arms can be placed below overhead cranes. 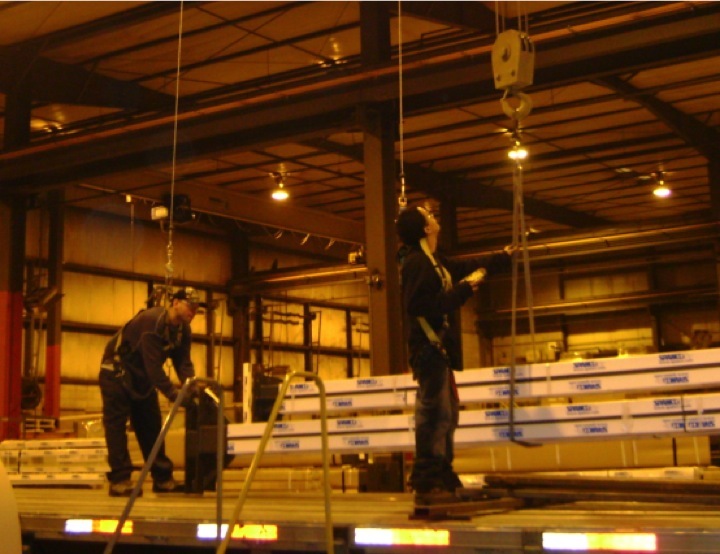 Systems like ceiling-mounted monorails or traveling bridges can also be positioned above overhead cranes. When the crane and the overhead fall protection must occupy the same space, there are potential hazards to consider: structural impact, fall arrest lanyard dragging, and entanglement. Structural impact can occur when a fall protection structure is located below a crane. This can cause damage to materials or structural failure, and endanger workers below. Employers can avoid structural impact using engineered control solutions like trip wires, safety stop sensors, or light curtains on fall protection structures. These devices would immediately disconnect power from the crane in the event of structural impact. Mounting sensors on the extremities of the fall arrest structure would shut off motion in the direction of crane travel and completely disable power to the system. As a result, the crane operator would have to file a “near miss” report and could even be required to complete a refresher operator-training course. In addition, design features can also be incorporated into the system that would help prevent an impact from occurring. Improving the visibility of the structure by painting it a bright color like safety yellow or incorporating flashing lights can help to focus and maintain worker’s awareness about the structure’s relative position to the crane and load. Lanyard pushing or dragging can occur when a fall protection structure is located above a crane. This occurs when a crane operator drives into a worker’s fall arrest lanyard and drags the worker who’s attached. This is a major safety concern because the crane operator is usually focused on the load, rather than the crane’s structure moving overhead. Mitigating this issue can be complicated. Employers can eliminate this hazard by employing engineering controls. 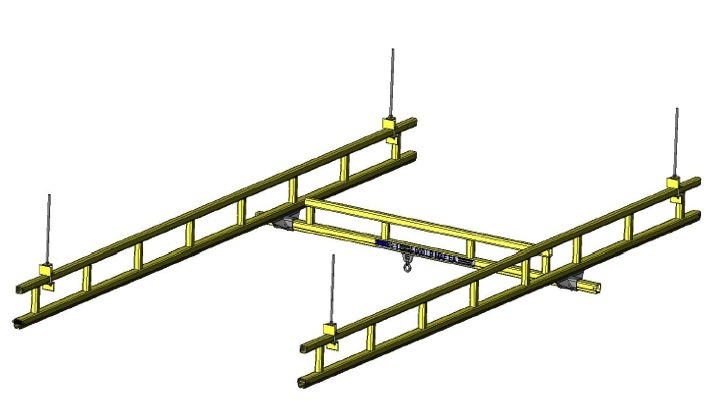 These controls are similar to structural impact solutions and include trip wires, safety stop sensors, or light curtains on the crane structure to eliminate power from the crane during impact. However, if engineering controls cannot be employed, employers can use administrative controls to prevent pushing or dragging. A typical administrative controls plan includes: executing and writing down a clear fall protection plan, and thoroughly training crane operators. Once the operator has received adequate training about the fall protection plan, ensure that he or she is able to see and communicate with all workers at all times. A signaler may be required if the point of operation is not in full view of the operator. Additionally, a lead man should be designated to direct the lift. This is the fall protection worker who is closest to the crane and the lifted load. If the crane is operated from a control pendant at the worker’s level, the best solution is to have the crane operator also act as the lead worker. Having the lead worker be the crane operator is usually the optimal solution because the crane operator is the least likely to drive the crane structure into his or her own fall protection. As long as other workers using fall protection are farther away from the crane and the load than the lead worker/operator, they are theoretically protected from being pushed or dragged. Entanglement occurs when the crane’s cables become entangled with a worker’s lanyard. This is a major hazard when the worker’s movements are relative to the hanging load block’s movements, which results in a circular “wrapping” motion. Administrative controls can also be effective in this situation. In this scenario, the workers wearing fall protection are the key to eliminating an entanglement hazard. The administrative controls plan must be clearly defined and written down, and fall protection workers must be trained to know all protocols. The cranes must be operated as slowly as possible, and clear communication between workers and crane operators is imperative. Workers must be fully aware of the crane’s lifting line position in relationship to their own lanyard and their co-workers’ lanyards. Workers must be able to clearly communicate with one another in order to notify anyone who may be in a dangerous position. All lifts should stop immediately if a potential entanglement situation exists. (ii) under the supervision of a qualified person. OSHA does not, however, define how many workers can be tied off to the approved hook at one time. Most people assume that it’s only one, but many companies limit the maximum amount of people to two. The safety professional in charge must use his or her professional judgment to determine what is safest for that particular application. For general industry, OSHA can allow direct attachment to a crane, but only if you are following OSHA’s hierarchy of controls. This means that the crane attachment point, crane controls, and administrative controls must be engineered or validated by a qualified person. Contact your local OSHA office for proper clarifications. For fall protection coverage in linear work areas, a qualified engineer can add an enclosed track anchorage system along crane bridges. In this situation, the administrative controls require the crane to be locked out and tagged out before using its structure as a fall arrest anchorage point. Employers should consult with their local state-run OSHA program or federal OSHA for more information on their specific plan to protect workers from falls. For reference and further clarification, check ANSI/ASSE Z359 Fall Protection Code, American Society of Safety Engineers, and Occupation Safety and Health Act (OSHA) 29 CFR, U.S. Department of Labor.